Private Pilot Training: From Zero to Hero, you can do it! Steve has been flying since 16 and spent 27 years in IT technical training; its a good combination. I am based at the Stapleford Flight Centre in north London. This an ideal place to learn as it has excellent facilities, safe aircraft and hard runways for all-weather operations. I can take a student with absolutely no previous flying experience and teach them to fly up to the grant of a Private Pilots License ("PPL"). My students range in age from 13 to 78 and all you need isto be medically fit and motivated. What can you do with a PPL? Well as an EASA License it is recognised throughout Europe and the United States and entitles you to fly a light aircraft during the day, in visual conditions in an aircraft that can carry up to 4 passengers. You can travel around the UK, or fly over to and around Europe. You be able to rent, hire, own or Group-share European-registered light aircraft. Having trained several hundred IT engineers during my career as an Authorised Apple Trainer, I have a wealth of experience in knowing how to explain complex issues by breaking them down into bite-sized pieces. This methodology applies equally well to aeroplanes, airspace, air law and meteorology as it does to operating systems, logic boards and TCP/IP ! I never forgot when I was learning to fly how difficult it was to navigate yourself through not just the theory and practice of flying an aeroplane but the maze of legislation that goes with it. For this reason when you become one of my students, I don't forget how hard it is for you, so I will personally coach you through the process, filling in the blanks that the EASA/CAA syllabus misses out. This Web Site goes someway to fulfilling that promise. I am based at Stapleford Flight Centre, in north-east London. With the advantage of a large fleet of aircraft and all-weather taxi and runways, SFC is the ideal place to learn to fly. 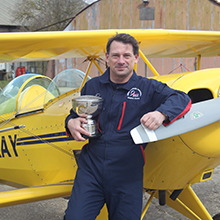 For those who are interested in a career in flying, Stapleford offer both the Modular and Integrated route to the holy grail of Airline flying,the "fATPL" or "frozen Air Transport Pilots License"
In addition to being a successful Aerobatic pilot as a competitor within the BAeA, Steve holds a full EASA Commercial Pilots License, with an Instructors Rating. This enables him to offer through SFC, what is called ab-initio training. "Ab-initio" is the industry term to mean "zero-experience", so even if you have never flown before, I can teach you all the way from your first flight, through to your own Private Pilots license.